Smiles Are Us Grenfell Street Welcomes You! We are a well-established practice with a name synonymous to Adelaide CBD’s CBD for many years and now warmly welcome you to our new facilities. We hope you love them as much as we do. 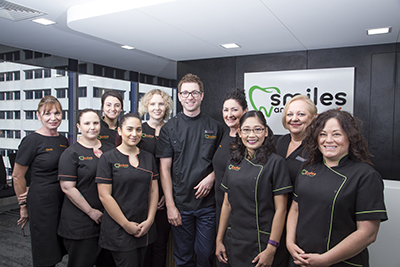 Proudly South Australian owned, we receive referrals from patients and dentists from throughout Adelaide and beyond and are affiliated with a number of National and International associations. Treatments are performed based on the latest information, technology and research. All procedures are preplanned and tailored to suit patient’s individual needs. Here at Smiles Are Us we love seeing kids each and every day. We recognize and our passionate about the dental health of our littlest clients and help to encourage and reward them. 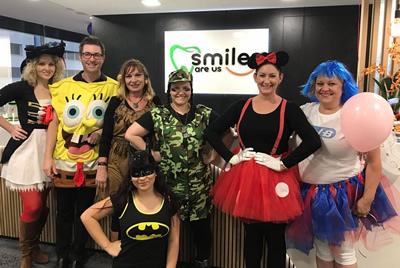 Every school holidays we have our wonderful “Dress up themed days” where our entire team and patients dress up together while making a trip to the dentist a fun experience with fun giveaways, healthy snacks , balloons and most of all lots of fun. Did you know you may be eligible for up to $1000 worth of dental treatment? Click here to find out more. Smiles Are Us has a long history with the following dental insurance providers and are Members First Providers for the following: Medibank Private, Bupa, Australian Unity and HCF. We proudly accept our Veteran Affairs clients also. Claiming has never been easier! With HICAPS immediate claiming available to you on the day of your treatment. All you need is your Dental Insurance Card and allow our friendly front office team to take care of the transactions for you. Smiles Are Us accept all insurance partners. Your dental care is important to us and we want to help you achieve your desired outcomes… Whether it be a whiter, brighter smile or to replace that missing tooth or to say goodbye to that denture that you no longer like we are here to help. We have partnered with MiFund Pty Ltd – to offer Interest Free Terms to patients looking to help with the cost of their dental treatment. Speak to us about how this can work for you today!